Is it possible to survive in Asia if you really want to be strict with a low carb diet? To be honest after going low carb for the past 4 years, I still have some difficulty eating out. My family knows that I never go into Thai or Vietnamese restaurants willingly and I will only go into a Korean restaurant if they have a BBQ option with unmarinated meats. My worst ever experience was in Hong Kong at a breakfast noodle place where the cook refused flat to just serve me the soup without noodles. I was truly upset because it would have been really easy to do but I guess Cantonese cooks do have a stubborn streak. I ended up without breakfast that day. Unfortunately that is why I preferentially go to countries with western style food options as this would give me easy options when eating out. But truth to tell I have a very Asian belly and there are many moments I crave a hot bowl of noodle soup or a rice dish. I really dream of the day that restaurants and even hawker stalls in Singapore would offer low carb alternatives. Nonetheless I have noticed in the past year that quite a lot of stalls no longer blink an eye when I ask for rice or noodles to be omitted. So perhaps the wheels of change are already in progress. Just today I watched a TED talk by Dr Sarah Hallberg (really highly recommended!) and was reminded of how far behind we are in Asia to make the changes to our diet and health. What she talks about is astounding but real – people with type 2 diabetes ditching their medications just by treating their conditions with diet. My own measured insulin levels were low at diagnosis and unlike typical type 2 diabetics I never had a slow slide into the disease. My HbA1C was through the roof at the time I was diagnosed and I started needing insulin from the word go. Nonetheless I believe I have been really fortunate to discover how to manage my diabetes well with a low carb diet and the past 4 years has been proof that it is possible to live well with this condition. I like surprising my endocrinologist with flat glucose lines…this is way different from the beginning when my glucose levels were around 20 mmol/dl. Doing this diet has required me to be innovative with substitutes; I always think it’s easier to go low carb on a western diet (just throw out grains and processed food and eat meat and vegetables) but it’s a little bit more tricky with Asian food. Still, here are one of the basic principles – just use cauliflower as a substitute for rice! Actually there are other substitutes such as shirataki rice which I recently found, which is also pretty nice. I confess however that I wonder when Singapore will progress in providing convenience low carb foods. When I was in San Fransisco this year I was filled with envy because Trader Joe’s had bags of riced cauliflower. The convenience was amazing. I still keep my ear tuned to when friends go to the US to try to see if they can bring back Lily’s chocolate or other easy snacks like Epic pork rinds. But those cravings aside, I think I haven’t really been that deprived. I guess I am really fortunate that I really love cooking and recreating dishes into low carb versions. Kid#1 seems to think there is no dish that I can’t make low carb and comes home with really outrageous requests. I have had to point out that it is impossible to make mooncake low carb…there are just some things that are not possible! But anyway with regards Korean food, it is possible to use substitutes to make low carb alternatives. 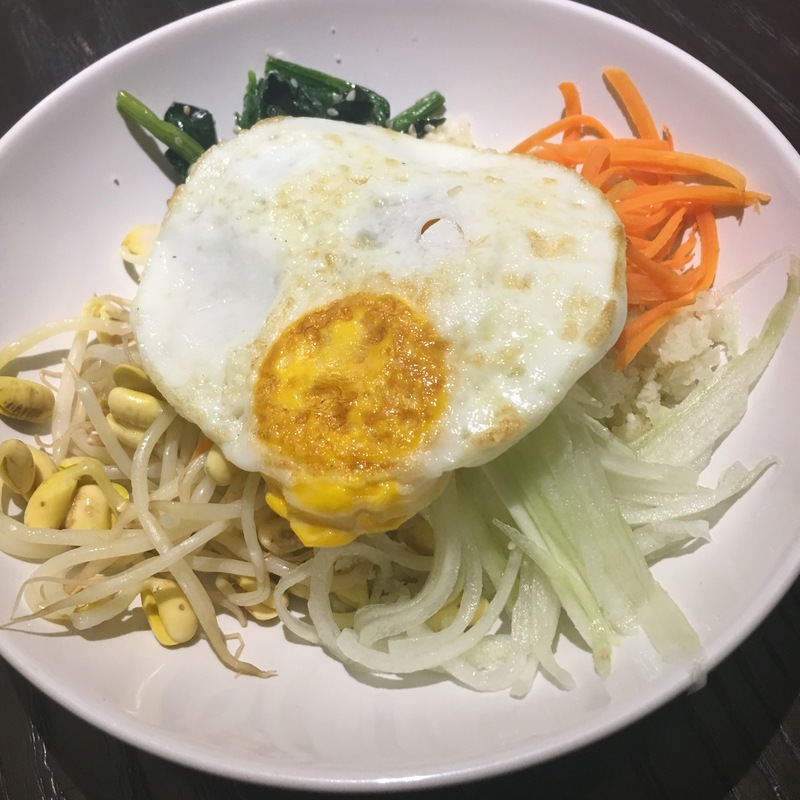 Here is the low carb version of Bibimbap – a Korean rice dish with lots of vegetables that is tossed just before eating. I served it with some grilled short rib beef and it was truly the bomb! Luscious grilled beef – made by kid#1 who is getting quite handy in the kitchen. The beef recipe will posted another day! In a non-stick pan, toast the sesame seeds till lightly browned. Remove and set aside. Bring a large pot of water to a boil. Blanch the soybean sprouts for just 1 minute, then drain and set aside. Wash the Chinese spinach leaves and cut into 2 inch lengths. Bring a large pot of water to boil. Also prepare another bowl with cold water. Blanch the spinach for 1 minute, then drain and transfer into the cold water to stop the cooking process. Drain the water, then squeeze out the water out of the spinach with your hands. Add the sesame oil and soy sauce and toasted sesame seeds and lightly toss. Set aside. Put the carrots into the microwave and microwave for 1 minute. Set aside. Cut the cauliflower into florets, then put in batches into a food processor and pulse several times to get rice-sized pellets (don’t over pulse). Heat up 1 tbsp oil in a large pan. Sauté the garlic and onions till fragrant. Add the cauliflower rice and stir fry. Add the salt and pepper to taste. Fry till the cauliflower is slightly soft but not soggy. Set aside. In a non-stick pan, fry the eggs sunny side up. Set aside. Finally the assembly! Put a serving of cauliflower rice into a bowl. Neatly top the cauliflower rice with soy bean sprouts, spinach, carrots, cucumber and finally the fried egg on top. Serve with kimchi and gochujang on the side. Gochujang is not low carb so if doing low carb either omit it or take very little of it.